This is the earliest of my dad's bridge columns of which I have a copy. First my trancribed (and slightly edited) version, then the original, scanned. by Jerome J. Schneyer, M.D. Most bridge players are plagued with maxims that do more toward adding to their confusion about the game than they ever help: "never lead away from a king," "second hand low," "when in doubt lead trump." One of the oldest chestnuts that trickles down to us from the early days of whist is: "always cover an honor with an honor . . . kings were made to capture queens." In knightly days perhaps, but not always at the bridge table. There is a magnificent dish served in fine restaurants and enjoyed by gourmets the world over: duck with orange sauce. Bridge players, too are familiar with duck, of another sort. The common situation is x-x of a suit on the board and A-x-x in declarer's hand in a no-trump contract. The suit is led and the declarer waits until the third round to take his ace, hoping that by so "ducking" he will exhaust the opening leader's partner of the suit so that he cannot return it if he wins the lead. There are, however, many other ducking situations, a little more esoteric, but profitable to know. The South of our example was no gourmet, indeed he was something of a hog; he was familiar with the common, garden-variety of duck but, beyond this, he relied on the aforementioned maxims. He didn't see, when the queen of spades popped up out of the East hand at trick one, how he could get better value for his king. "Kings are made to capture queens," he was heard to mutter, as he scooped in the first trick; besides, if the diamond king were onside, he might as well make twelve tricks. Too bad! South had forgotten that his side had only contracted for nine tricks; when his nine of diamonds lost to the king at trick two, East returned a spade right through J-9 and West gleefully rattled off four spade tricks to sink the contract. South should have realized that a gourmet-flavored duck was in order. Had he waited until the second or third trick to take his spade trick, West would have been unable to return the suit and South would have made at least nine tricks to wrap up the rubber. And what if East had three spades to start with and West allowed South to hold the second spade trick? Why then, West could take at most three tricks in spades altogether and that, added to the king of diamonds, would not have been enough to beat three no trump. 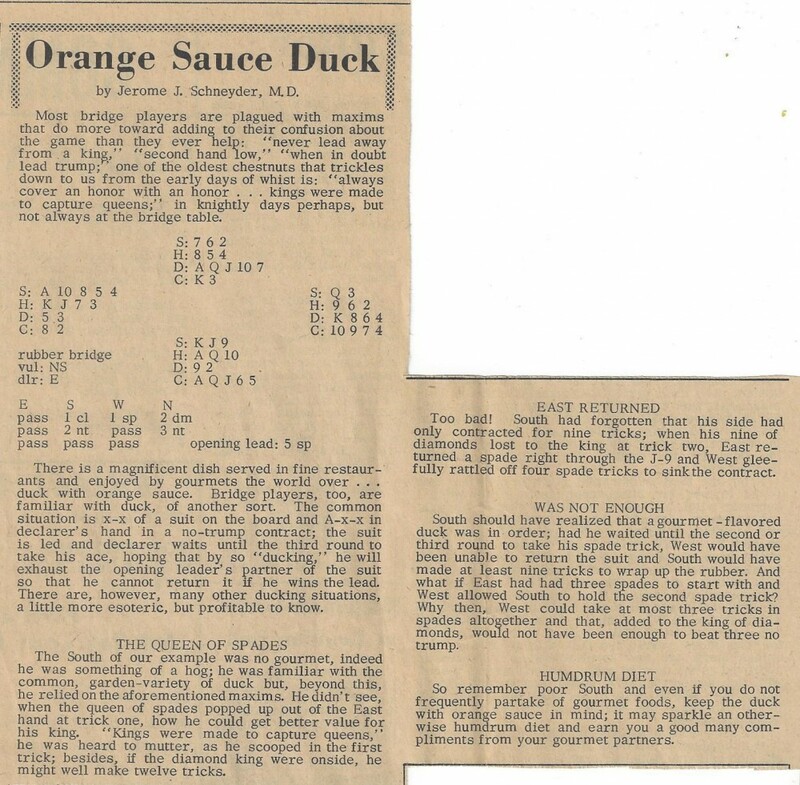 So remember poor South and even if you do not frequently partake of gourmet foods, keep the duck with orange sauce in mind; it may sparkle an otherwise humdrum diet and earn you a good many compliments from your gourmet partners.